A quiet weekend bingeing on Goliath or Picasso, reading The Letter and planning a major construction project, life is good…you decide popcorn or jelly bellies for dessert! Fabulous Farmer’s market goodies this week local farm fresh peaches, great tomatoes, and plenty of choice meats to choose from…beautiful zucchini, yellow squash and little tomatoes were perfect for a new and easy veggie sheet pan roast, just add some fresh + dried herbs, drizzles of EVOO, salt, pepper, and grated parmesan cheese. Roast for about 20 minutes in a 375º-400º preheated oven. This week over at the cooking club the assignment any recipe from From the Farm and since I missed my contribution last week I can still submit this fantastic and easy recipe…I chose Anthony Bourdain’s recipe for a crispy Asian style pork chop sandwich, seasoned with a little of this and from the Asian pantry. While you can serve this chop on any bun of choice it was just as good between two slices of fresh bread. 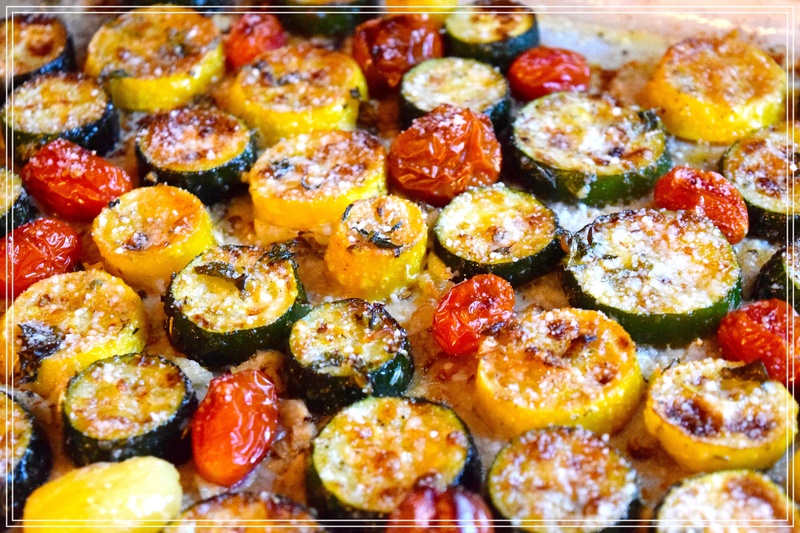 Roasted tomatoes, yellow squash, and Zucchini. 2 cups peanut oil, for frying, plus more as needed, Oh I didn’t need this much oil! Insert the pork chop into a large ziplock bag and pound to ¼-inch thickness, using a meat mallet. In a small bowl, whisk together the soy sauce, rice wine, vinegar, sesame oil, garlic, five-spice powder, and sugar. Place the pounded pork into the plastic bag or nonreactive container and pour the marinade mixture over, turning the chops to ensure that they’re evenly coated with liquid. Seal the bag and refrigerate for at least 1 hour and up to 12 hours. Remove the chops from the marinade and brush off the garlic. Beat the egg in a shallow bowl and place the flour and breadcrumbs in separate shallow bowls. Season the flour with salt and pepper. You may need to add a tablespoon of water to the beaten egg, to loosen its texture so that it adheres evenly to the meat. To a large, heavy-bottom frying pan, add the peanut oil and heat over medium-high. 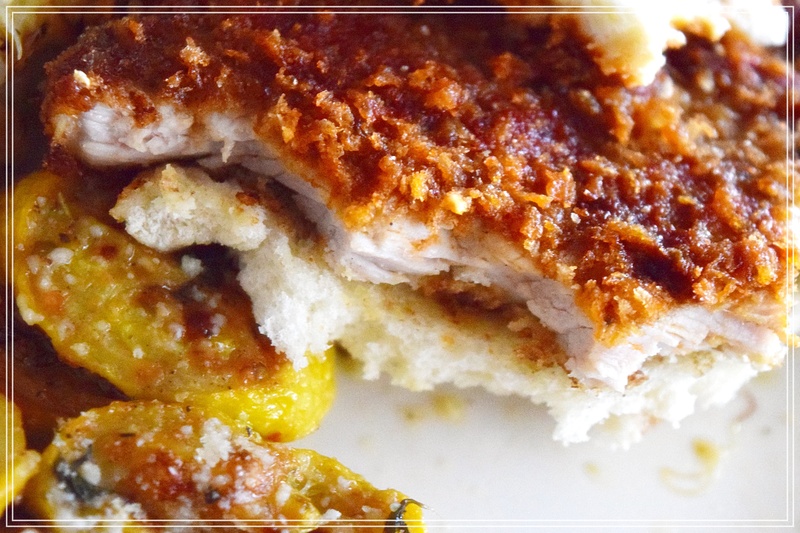 While the oil heats, dredge the chops in the flour, patting off any extra, then in the egg, then in the breadcrumbs. Test the oil with a pinch of breadcrumbs. If they immediately sizzle, carefully slide the chops into the hot oil, working in batches if necessary to avoid overcrowding the pan and bringing down the temperature of the oil. Cook for about 5 minutes per side, or until golden brown. Remove the cooked chops from the oil and let drain on the lined sheet pan. Season lightly with salt. Assemble the sandwiches and serve with the chili paste alongside.